For as long as we could remember, we at Gawker have loved Gunnar eyewear. They're great looking specs for the eyestrain avoidance type and, for a limited time, 20% off in a special to Kotaku readers. According to a study from the Vision Council, nearly 70% of US adults experience digital eyestrain as a result of their reliance on computers, mobile devices, and gaming gear. In fact, that eyestrain is worse on adults 18-45, which is probably most of us—since we're a lot more focused on our gadgets than our older counterparts. Eyes that are less fatigued: Gunnars use a patented lens technology that ensure your eyes stay focused and less strained. Eyes that aren't so dried out: Gunnars uses special lens and frames that shape around the face to protect against dry air. Total eye comfort: Gunnars filter light through its special tints and coating that reduce harsh blue light and glare that emanate from the screens of your gadgets. In short, you'll be able to get more done, be more productive, and feel great about it. Plus, you'll look pretty good too; there are many styles to choose from. 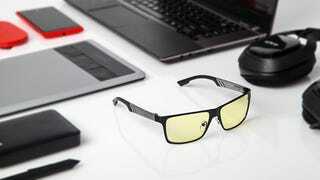 Lifehacker readers get 20% off using the code "Kotaku20" at Gunnar Optiks. If you're not at all happy with your purchase, Gunnar also offers a 30 day money back guarantee.